Voyager: How is climate change affecting harmful algal blooms? Neela W., 10, Jamaica Plain, Mass. Q. What can you tell me about Cyanobacteria? I have been reading about red tides in Florida and have seen blue-green algae blooms in rivers near Boston. I am wondering if climate change is increasing how often and how bad these blooms will get? - Neela W., 10, Jamaica Plain, Mass. A. The situation affecting Florida is a strange confluence of freshwater and saltwater species creating a perfect harmful algal storm. 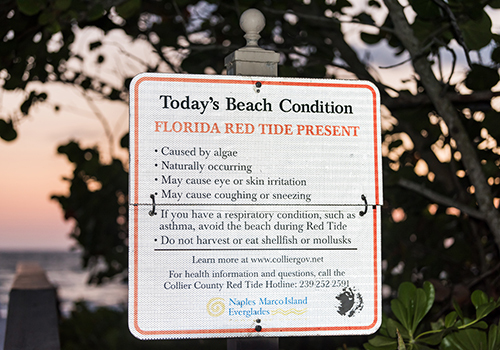 First, there has been an ongoing “red tide” along the west coast of Florida since last October. This bloom is caused by one species of Dinoflagellate Karenia brevis, a phytoplankton known to kill fish with its neurotoxin and even to close down beaches when the aerosolized version of the toxin pollutes the air. Second, a particularly intense bloom of Cyanobacteria called Microcystis appeared not long ago in Lake Okeechobee, where these blooms have become a recurring problem in recent years. The U.S. Army Corps of Engineers routinely releases Lake Okeechobee waters to Florida estuaries and coasts to alleviate stress on levees. Unfortunately this practice allows Cyanobacteria to flow to the ocean. With the discharge of Cyanobacteria-laden water in pulses over the last several weeks and the already intensifying K. brevis bloom on the coasts, Florida ecosystems have been hit hard. Some 267 tons of fish, manatees, whale sharks, and dolphins have been killed by K. brevis. The potential for the toxins produced by Microcystis, called microcystins, to wreak havoc is also large, particularly for livestock and pets. Scientists are currently trying to find out whether microcystins can become airborne, thereby making it dangerous to live and breathe the air near lakes where Cyanobacteria blooms are common. There is a lot of debate about which types of algae will spread in response to climate change. Cyanobacteria definitely like it warmer. Dinoflagellates grow fairly well at warm temperatures too but also need nutrients to grow. They thrive when nutrients in runoff from agriculture and urban landscapes reach the ocean and become available to them. The general consensus in the scientific community is that the proliferation of Cyanobacteria in lakes and reservoirs worldwide over the last several decades is a clear and direct response to warming temperatures as well as poor management of nutrient runoff. – Clarissa Anderson is a biological oceanographer who specializes in prediction of harmful algal blooms and toxins. She is also executive director of the Southern California Coastal Ocean Observing System.